In his baseball career, Dolph Camilli experienced the best of times and the worst of times. A fine-fielding first baseman and solid hitter, he was with winners and losers and gave his best to both. Skip Clayton and Jeff Moeller, authors of 50 Phabulous Phillies, rank the Phils trade of Dolph Camilli to the Brooklyn Dodgers in 1938 one of the worst ever made. The Phils got Eddie Morgan and $45,000 in return. The Dodgers got a good defensive first baseman, a solid hitter, and the National League’s Most Valuable Player of the 1941 season. Adolph Camilli was born in San Francisco on April 23, 1907. His father Alezzio “Alex” Camilli was 23 years old when he left Sassoferrato in Ancona, Italy and came to America in 1899. In America he met and married Albena “Eliza” Tassi; her parents had come a decade earlier from a village near Rome.The two met in the mining town of Iron Mountain, Dickinson County, Michigan. Alex and his brother Giovanni worked baking and delivering baked goods created by their wives. After the 1906 earthquake devastated San Francisco, a call went out for laborers to help rebuild the city and among those responding was Alex Camilli, by then living in Hibbing, Minnesota. The family moved to San Francisco where Alex became a carpenter, building houses. Dolph attended Sacred Heart Academy High School. His brother Francisco became a heavyweight boxer under the name of Frankie Campbell, but met a tragic end. Frankie was knocked out in an August 1930 bout with Max Baer and died 12 hours later as a result of the blows. Camilli played baseball, and had the opportunity to turn professional in 1926, working as a first baseman for the Class C Logan Collegians in the Utah town and for the Pacific Coast League San Francisco Seals, hitting .311 for Logan and .312 for the Seals. In 1927, he also played for both teams, batting .311 again for Logan but struggling and hitting .244 for San Francisco. In 1928, he hit a solid .333 for the Salt Lake City Bees. The Bees were a Class C team, but the success he had there helped him win the first-base slot with the Sacramento Solons in the Coast League, where he put together five strong seasons from 1929-1933, averaging .297. It was during the 1930 season that brother Frankie lost his life in the ring. Dolph had back-to-back 200-hit seasons, but missed out on the end of the 1933 season because he was beckoned to Chicago to play for the Cubs. Camilli first began his big-league career with the Chicago Cubs, debuting on September 9, 1933. He was 0-for-6 that first day, but in a doubleheader on the 10th, his two-run homer was the margin of victory in a 4-2 win over the Phillies. He appeared in 16 games that first year, driving in seven runs and batting .224. He began 1934 with the Cubs, too, and played in twice as many games (hitting .275) when he was traded to the Phillies for first baseman Don Hurst on June 11, 1934. It turned out to be a great deal for the Phils. Dolph Camilli. The very mention of his name in Philadelphia baseball history conjures up the leanest years in the club’s history. It wasn’t that they lacked good players, but club president Gerry Nugent did not have the means to keep the team in decent financial shape. He was a shoe salesman and had become the owner of the ball club. Nugent, a longtime Philly fan had been a shoe salesman of meager financial means. Though he’d inherited the stock in the club, his lack of capital forced him to run the ball club on a shoe string (no pun intended) and often needed to sell off his best players in order to keep the club afloat. Dolph Camilli became one of those he felt forced to sell. Camilli wasn’t pleased at being dealt to the Phils, perennial cellar dwellers, while leaving a potential winner in the Cubs. He talked about quitting baseball and going home. However, Phillies manager Jimmie Wilson told him he was going to play every day, which convinced Dolph to play with the Phils. Camilli often had problems with his contract with the Phillies brass. He held out in both 1937 and 1938. Camilli said, “No matter what kind of year you had all they wanted to do was give you about a $1,000 raise.”  These holdouts, added to the pressures of limited cash, caused the Phillies to trade Camilli to the Brooklyn Dodgers for $45,000 in cash and an unknown outfielder named Eddie Morgan. Morgan never played a game for the Phils. The very next year, Camilli was named to the N.L. All-Star team. In later recalling his days as a Phil and playing at Baker Bowl, Camilli said, “We always faced tough pitching in that park. Other teams knew we had good hitting and they didn’t pitch any humpty dumpties against us and often they were left-handers. As a result, I think I hit them better than right-handers. I hit the left-handers good and the more I saw them, the better I hit them.” Camilli recalled some good games he had against Carl Hubbell and Dizzy Dean. “I don’t know what I hit off Hubbell percentage-wise but power-wise I hit quite a few homers off him.”  Camilli said that Dean and Hubbell were two of the best pitchers he ever faced. Camilli was also regarded as one of the finest first sackers in the National League. In 1937 he led National League first basemen in fielding with a .994 average. He played 5 ½ seasons for the Dodgers, hitting for a combined .270 average. Four times he drove in more than 100 runs and four times he scored more than 90. Twice more he led the league in strikeouts, but he also led the league in walks twice, too. His 34 home runs led the National League in 1941, as did his 120 RBIs. He was indeed an important part of the push to the pennant, part of why he was named for a second time to the All-Star team and was voted the league MVP. Camilli played in each game of the 1941 World Series, taken by the Yankees in five, but only hit .167 – three hits in 18 at-bats. He struck out six times, and drove in just one run. The Giants traded his rights to the Oakland Oaks of the Pacific Coast League in December for infielder Bill Rigney. 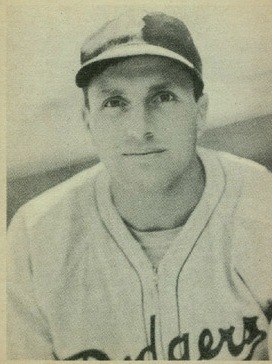 In 1944, Camilli returned to baseball as player manager of the Oakland team. He played in 113 games with a batting average of .289 with 14 homers before a foot injury in August forced a finish to his play. As manager, he led the Oaks to a third-place finish. In 1945, he returned as Oaks manager, but played little, going to bat only 17 times. He did start one game as a pitcher, however, going five innings but collecting the win. In June, he was fired as the manager and took advantage of the need for established players during wartime, signing as a free agent with the Boston Red Sox. He appeared in 63 games, batting .212. With the war over, and so many veterans coming back, Camilli was released in December. He had three more disconnected managerial stints – 1948 with Spokane, 1950 with Dayton, and 1953 for the Magic Valley Cowboys in the Pioneer League in Idaho. For the next 25 years he spent most of his time as a scout for the Yanks, A’s, and Angels before finally retiring in 1971. Camilli and his wife had five sons, all of whom played baseball to some degree. Dolph Jr and Bruce Camilli even signed bonus deals for the Yankees, both on the same day. There were two daughters as well, both of whom were involved in athletics. The only child to make it in big-league ball, however, was Doug, a catcher, born at the end of the 1936 season. Doug spent nine years in the majors with the Los Angeles Dodgers and the Washington Senators in the 1960’s, then worked as a bullpen coach for the Red Sox for four years and went on to work as a manager, coach, and roving instructor. Dolph Camilli died on October 21, 1997 in San Mateo, California, at the age of 90. His body is interred in Cyprus Lawn Memorial Park at Colma, San Mateo County. He was survived by his second wife Molly, five sons, Richard, Dolph Jr., Bruce, Doug, and Don, as well as two daughters Dianne Abraham and Joann Griggs. Sixteen grandchildren and 14 great grandchildren also survived him. His first wife Ruth had died in 1980. Johnson, Catherine. “Frankie Campbell: Tribute to a Forgotten Man”, www.maxbaer.org/frankie.html. William Baker, who owned the ball club and for whom Baker Bowl was named, died suddenly in December 1930. Shortly before his death he had gotten rid of one business manager and replaced him with Gerald P. Nugent Sr. In a curious bequest, Baker willed his Phillies stock both to his wife and to Nugent’s wife May Mallon Nugent, his secretary and by then the club secretary. When Mrs. Baker died a few years later, she also willed her stock to Mrs. Nugent and her son Gerald Jr. By 1933, Gerald Nugent Sr. had become club president. Clayton, Skip, and Jeff Moeller. 50 Phabulous Phillies. (Champaign, IL: Sports Publishing Inc., 2000), pp. 43-45. New York Times, October 22, 1997.